The majority of mums will know the brand sudocrem for their nappy nash cream. I used it on munchkin and will use it again for munchkin number 2. 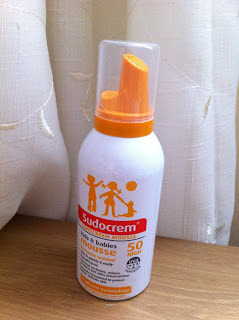 Sudocrem have recently launched a new product the Sudocrem sunscreen mousse and I was sent one to review. In all honesty I never used to bother with sunscreen but since having munchkin I have realised how important kids sun protection is. Unfortunately the sun has been a bit sparse in our region at the moment and when it has decided to show it’s face, it has been playing hide and seek. However, this week we did have some sun so we decided to quickly use the mousse before the rain came back in force. I have had some bad experience with sun creme in the past, too runny, doesn’t smell nice, leaves an oily feel and I thought this would probably be the same. The mousse comes up all light and fluffy (not runny) and therefore is easy to apply. No drips anywhere! It rubs in very quickly and you are not left with an oily feel everywhere and it left my hands feeling smooth after applying it. As it rubs in quickly you are not spending ages applying it on a child who just wants to go out and play. It has SPF 50 which is ideal for young skin and has 4 star UVA protection. I also love the fact that is has not been tested on animals and the can is made from 90% recycled aluminium. I will definitely use it again – when the sun decides to make an appearance and actually stick around! Disclaimer: I was sent a sunscreen mousse for the purposes of review. However all thoughts and opinions are my own.